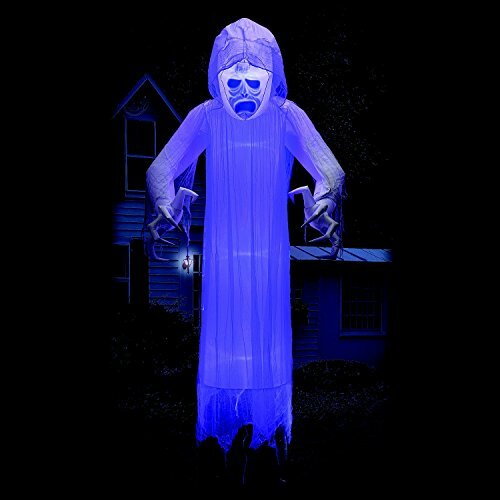 Flickering black lights provide lightshow effect Self-inflating decoration fills up in seconds 80-watt motor included in base Designed to create a floating effect Includes 4 base stakes, 4 tether stakes and ropesCreate a spooky effect on your lawn with our 12-foot Floating Halloween Ghost with Lightshow Effects. The flickering black lights emit an eerie lightshow to accentuate the floating effect of the self-inflating ghost. This inflatable piece of lawn décor fills up in seconds, has a built-in 80-watt motor and comes with the necessary ropes and stakes. If you have any questions about this product by eva, contact us by completing and submitting the form below. If you are looking for a specif part number, please include it with your message.